Passed away peacefully at St John of God Hospital Bunbury 12.04.2019. Dearly loved mother of Amy and Matt and mother-in-law to Zoe. Loved daughter of Beth, partner of Keith and friend of Phil. "How lucky we are to have something that makes saying goodbye so hard" - by Winnie the Pooh. To my Brony blue eyes. I won't cry because it's over but smile because you happened. I am so thankful for each and every precious moment I had with you. I love and miss you. Mum. Bronwyn - I was blessed to have you as a sister and friend. We have shared laughter, joy, sorrow and tears. You were always there for me. I miss you so very much. I was so privileged to be able to be with you to the end. Love you. Fiona, Steve and Family. The Funeral Service to celebrate the life of Bronwyn Kaye (Bron) Gumbrell of Bunbury will take place in the Crematorium Chapel, Belcher Street, Bunbury at 2.00pm THURSDAY (18.4.2019). No flowers by request in lieu donations would be appreciated to Dot's Place. Envelopes will be available at the Service. A very caring lady, taken too soon. 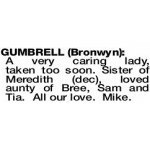 Sister of Meredith (dec), loved aunty of Bree, Sam and Tia. All our love. Mike.